There’s one thing that pops to mind when you ask people about artificial intelligence in the manufacturing industry, particularly in the automotive landscape: Autonomous or driver-assisted cars. And the future of driverless vehicles may in fact arrive sooner than many people think, there’s actually more concrete contexts for artificial intelligence (AI) in today’s manufacturing sphere. AI has the potential to impact the automotive manufacturing supply chain in equally profound and interesting ways beyond the idea of the driverless car. In fact, AI has the potential to be a truly disruptive force in the way automotive manufacturing companies produce vehicles and how the consumer interacts with the end product. With AI as an increasingly common technology platform, the manufacturing industry — automotive sector in particular — is set to experience significant changes in the coming years in terms of production and supply chain management. As vehicles become more integrated, individualized, and complex, manufacturing companies will have to leverage more lean methods of production and supply chain logistics to keep pace with the demands of such a variant-rich industry. With this in mind, let’s examine the future of artificial intelligence in the automotive industry (as well as the manufacturing landscape in a larger context) and how AI has the potential to change the game in terms of production, supply chain management, and customer relations. Industry analysts estimate by the year 2020 more than 250 million vehicles will be connected to the internet (and possibly to each other via the internet). These vehicles will be equipped with a myriad of sensors, embedded connectivity platforms, geo-analytical capabilities, and other methods of incorporating Big Data as a baseline of operations. As such, the Internet of Things principle will become a critical link in integrating these disparate systems into a unified operating platform. What does this mean for automotive manufacturing companies? It means manufacturers will have to work more closely with software developers and other players in the software industry to successfully integrate these smart systems into new vehicles and ensure effective communication between these systems. This means the potential for new partnerships and an expansion of existing partner networks, which can result in exciting business opportunities but also more complex networks with new partners in disparate parts of the world. Intelligent, integrated methods of of monitoring the condition of a vehicle and assessing when repairs or replacements of component parts are needed. Data gathering from sensors and other input methods sent directly to manufacturers so adjustments or tweaks to operational systems can be made in future production programs. Smart sensors that can detect potential health or impairment issues with drivers and summon essential personnel to protect the driver and other motorists. AI enables software systems and other operational platform to engage in machine learning whereby systems essentially mimic the ways in which humans learn and intake data and other sensory input. This means software systems are given data or other inputs and learn from experience how to effectively sort and structure this data to provide the user insights or windows into any given element of production or operation. AI drives machine learning which has the potential to create truly responsive systems in which software can aid drivers given certain situations or elements (weather, driving conditions, road conditions, etc) or respond to disruptions in vehicle operation such as traffic jams, or disrupted driving routes. What does this mean for automotive manufacturing companies? 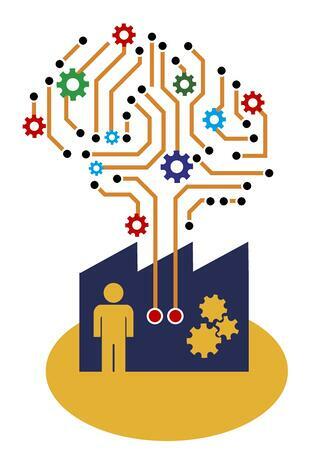 This means manufacturers can gain valuable insight into what consumers want or need based on advanced, detailed reporting gathered and distributed by AI via machine learning. For example, AI via machine learning could help automotive manufacturers engineer a better windshield with enhanced sightlines if reporting shows drivers are using their headlights during off-hours. Imagine a scenario where you’re driving past a supermarket and you receive a notification on your vehicle’s dashboard screen that alerts you to certain items you need to pick-up from the supermarket. In this example, your vehicle is probably connected via IoT to your smartphone which contains a grocery list or even your refrigerator which digitally keeps track of the items in your refrigerator and their condition. This may sound like something out of a science-fiction story, but cloud-based intelligence and the sharing of information and data between connected systems is quickly becoming a reality thanks to AI. Cloud computing and cloud-based intelligence via AI has the ability to integrate many of aspects of a consumer’s life via their vehicle. Big Data, advanced analytics, and Industry 4.0 are already coming together via AI to help automotive manufacturing companies produce vehicles that essentially act as a command center for all things driving-related. For example, cloud-based intelligence via AI has the potential to allow drivers to place a take-out order at a restaurant based on their location or projected driving route to allow motorists to place their order well ahead of time. For manufacturing companies, this means a deeper understanding of their customer base in order to incorporate the right software systems for a truly integrated driving experience. Gone are the days when automotive manufacturing companies simply select features or applications based on guesses about what a customer might want. With AI, automotive manufacturing companies will have the real-time data and feedback to gain a deeper understanding of customer wants and needs to best meet consumer demands.